Palma Vecchio, whose real name was Jacopo Negretti, was the first representative of a family of artists active in the Veneto until the first quarter of the 17th century. Born in 1479 or 1480 in Serina, near Bergamo, by 1510 he is documented in Venice although he probably moved there prior to that date. Palma Vecchio lived and worked in Venice for the remainder of his career. Nothing is known of his early training although the style of his first works suggests that he may have trained with one of the Bergamesque painters living in Venice, possibly Andrea Previtali. By 1513 he was already a member of the Scuola di San Marco. Despite the fact that none of his works is signed or dated, their chronology is easy to establish through the evolution of the artist’s own, highly individual style. His early works are notably influenced by Giorgione but from 1520 Titian became his principal model. 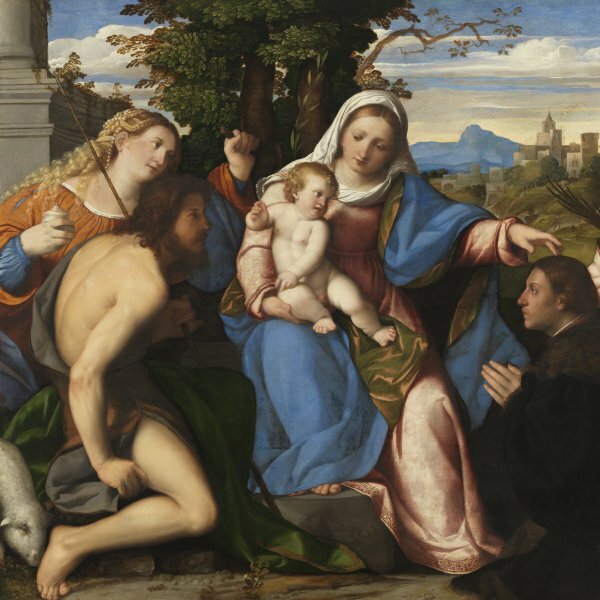 Palma specialised in the genre of the Sacra conversazione, already used by Titian, with its horizontal format and beautiful, serene figures set against a landscape background. Among his finest examples are: The Virgin and Child with Saints (Kunsthistorisches Museum, Vienna); Sacra conversazione (Museo Thyssen-Bornemisza, Madrid); and The Holy Family with Mary Magdalen and the infant Saint John the Baptist (Galleria degli Uffizi, Florence). Another Titianesque motif frequently used by the artist was the depiction of halflength female figures, in which Palma focused on the woman’s sensual beauty and reduced the allegorical content found in Titian’s versions. The two finest examples of this group, both of which depict the same woman, are in the Kunsthistorisches Museum, Vienna, and the Museo Thyssen-Bornemisza, Madrid.